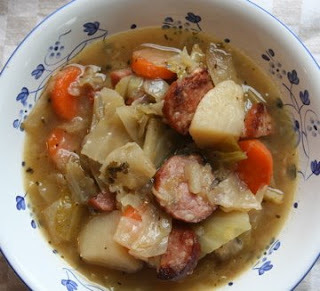 It is more like a winter soup and it is already spring, I agree, but it tastes delicious! I made it for a bunch of my friends for March 15th to celebrate this Hungarian National Holiday. They all loved it! For dessert we had Kürtőskalács on the grill, and that was even a bigger hit! The recipe for this soup is sooooo easy .....of course when you make it for a crowd you need to double or triple it! 1/2 of a Polish kielbasa or any sausage (about a 7-inch-piece), cut up and sauteed in a pan for 5 minutes . Saute the onion in a tsp. of oil ( I used duck fat) for a couple of minutes. Cut up the veggies more or less the same size (not too small), add them to the onion, add the stock/sauce and enough water to cover + a little bit more . Season it but be careful with the salt! When the veggies are almost done add the sauteed sausage pieces, too and cook them together for 5 more minutes. Serve it with home made bread and Bull's Blood red wine (that is the only Hungarian wine available locally) Enjoy! This looks great! You can use artisan kielbasa, like the kielbasa sold at the Winter Slow Food Market on Sunday at Tre Piani.